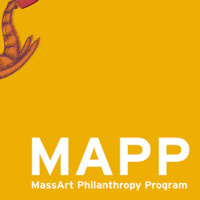 Please stop by the MAPP table for some goodies and to learn more about the impact philanthropy has here at MassArt! We will also be collecting pocket change to support student scholarships! So please stop by, learn more about giving back, grab some stickers, a Marty temporary tattoo, and learn more about our wonderful community.